Full disclosure: I’m writing this post at 10am. That’s 10am, today. Like, now. Last night, Lu and I went out to a restaurant in Chelsea called Toro. Fan-freaking-tastic. Holy moly, if you go, make sure you order the chickpea and chorizo stew with stinging nettles. I’m still licking my chops. Anyway, I had full intentions on waking up early this morning to write this post. Clearly, the tempranillo blanco won. 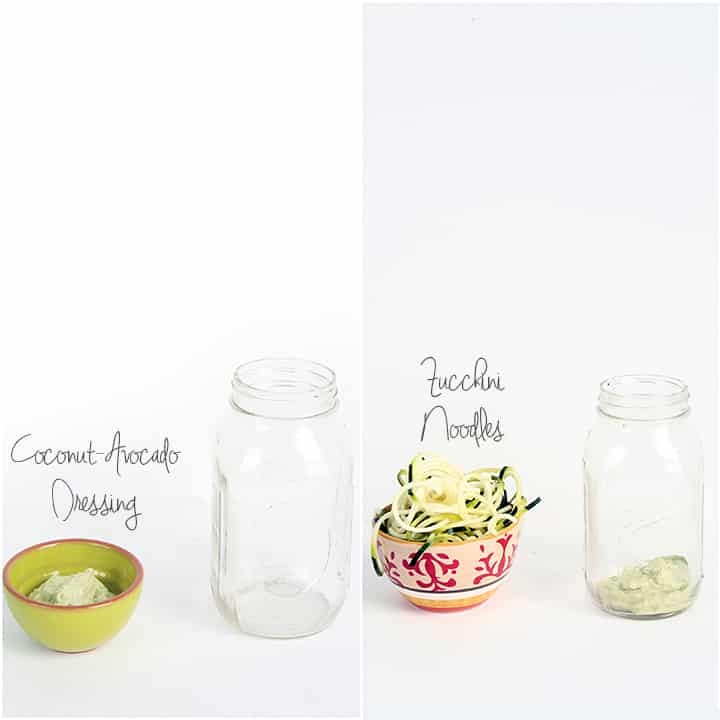 So, we’re a little delayed, but, I’ve got something super special for you today: mason jar zucchini noodle salads! Let’s go back to Toro for a second. Wow. First off, tempranillo is my favorite red wine. Imagine my excitement when I saw “blanco” next to it – they make it with a white grape?! Probably the best glass of wine I’ve ever had. It’s easy to love wine when you’re in a beautiful setting with beautiful people and beautiful food. Between the crispy pork belly, the tuna crudo and the garlic shrimp with chiles, I was beside myself. We ordered 8 tapas and sealed the deal with a chocolate dessert. The waitress read the three options off and Lu goes “we’ll take the last one” immediately (he heard chocolate) and so I can’t tell you exactly what it was, but it was perfectly portioned and outstanding. Now that I’ve been honest, let’s get to the good stuff: the recipe! While I really really want to call this a “zalad,” I’m afraid to because a restaurant chain down south called “Zaxby’s” apparently has filed for or has a trademark on the word “zalad.” So, poo poo. Unfortunately, I don’t own a microwave, so mug cakes aren’t in my future. But, I’ve got plenty of mason jars. Actually, when Lu and I first moved into our apartment in Jersey City together, we searched Amazon for the perfect collection of mason jars. We wanted that hipster restaurant feel. To buy this large Kerr mason jar pictured in the images, click here. 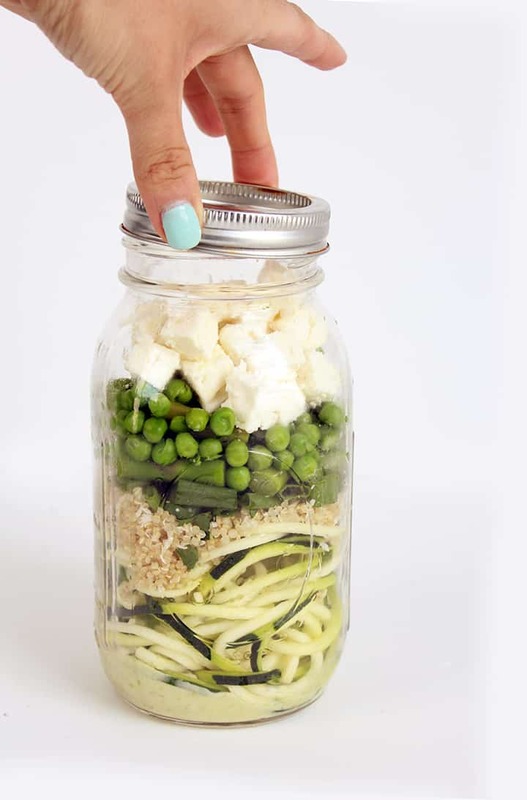 Today, we’re layering all sorts of healthy ingredients into a mason jar that’s perfect for meal prepping for the week or for bringing leftovers to lunch the next day. I especially love this mason-jar-lunch concept, because I notoriously eat salads fit for a dinosaur. I eat salads two-three times the size of my face. This salad is the freshest thing you’ll eat all week. 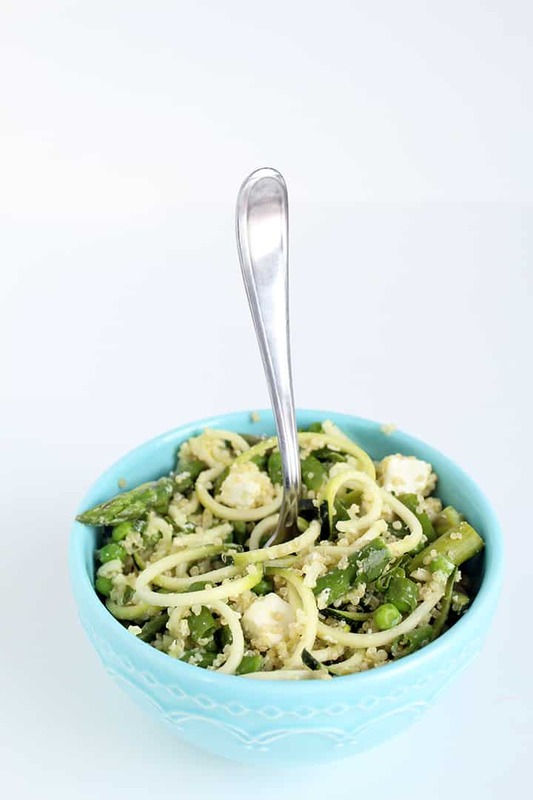 Honestly, the coconut-avocado-lime dressing is out-of-this-world amazing and is perfectly light and creamy to coat the zucchini noodles. The coconut flakes mixed in with the quinoa really bring out the flavors in the dressing. Quinoa, feta and peas give this salad a vegetarian protein punch. Plus, the feta adds that saltiness that the salad needs. 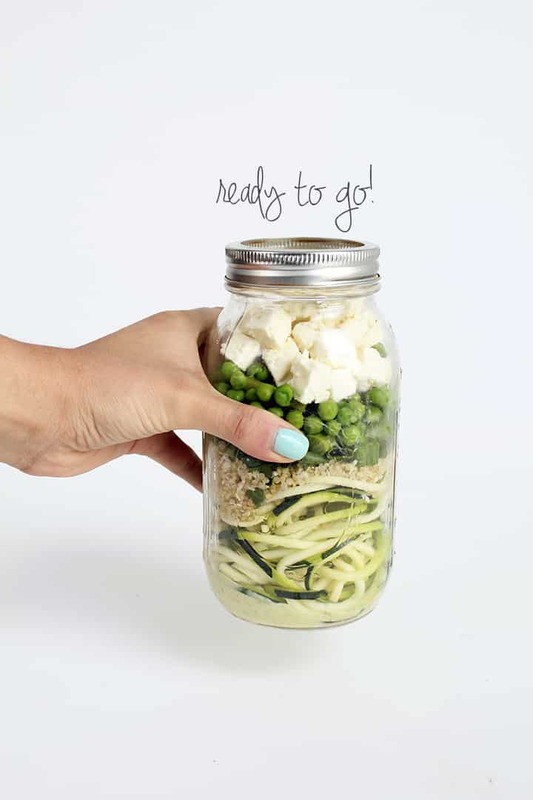 Tip: When packing mason jar lunches with zucchini noodles, it’s best to use creamy dressings. Let’s get started. Please excuse my white balance issues. Still working on that. Place your dressing at the bottom. Then, add in your zucchini noodles. 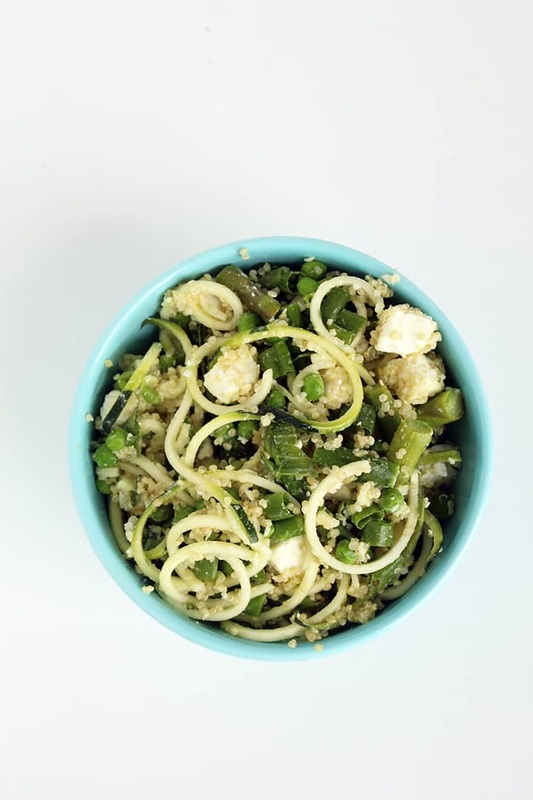 Top the zucchini noodles with the quinoa. Then, add in the scallions. Top the scallions with your peas and asparagus. Then, top with feta. I said, top with feta! Once you have your lid, you’re ready to go! How fun are these mason jar salads? I’m thinking of doing one each week. What do you think? Would you like that? 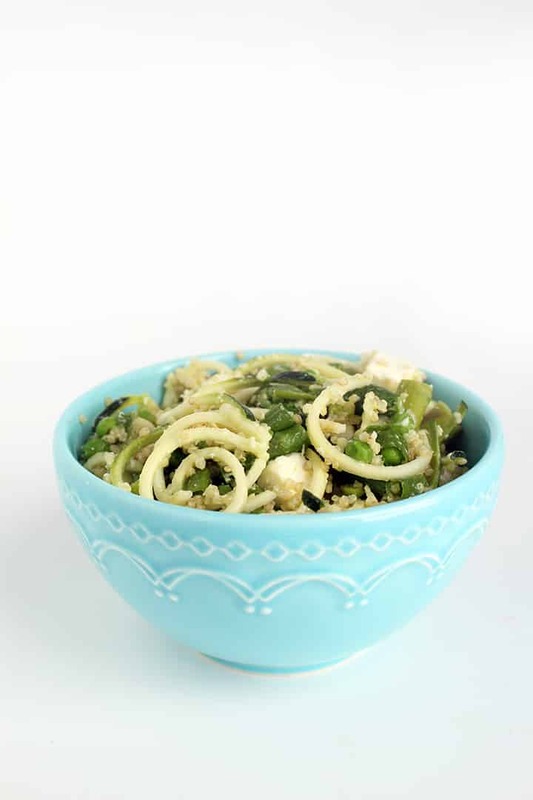 Follow Inspiralized’s board Spiralized Salads on Pinterest. Inspiralized eBook – Last Day to Purchase! Unfortunately, my eBook will no longer be available for purchase as of Saturday, March 22nd so if you haven’t purchased it yet (and have been meaning to), now’s your chance. Today’s the last day! In light of all this, I’m offering my final eBook discount code, valid today through Friday. Enter “GOODBYE35” upon checkout to receive the discount off the $9.99 eBook. For more information and to purchase the eBook, click here. In a food processor, place in all of the ingredients for the dressing. Pulse until creamy. set aside. In a bowl, combine the quinoa, cilantro and coconut flakes. Toss to combine and set aside. Bring a small saucepan filled halfway with water to a boil. Then, add in the asparagus. 1 minute later, add in the peas. Cook for 3-4 minutes or until vegetables are cooked and pour out into a colander. Assemble your mason jar salad. First, put in dressing. Second, the zucchini noodles. Then, the quinoa. Then, the scallions. Then, the asparagus & peas. Then, the feta. 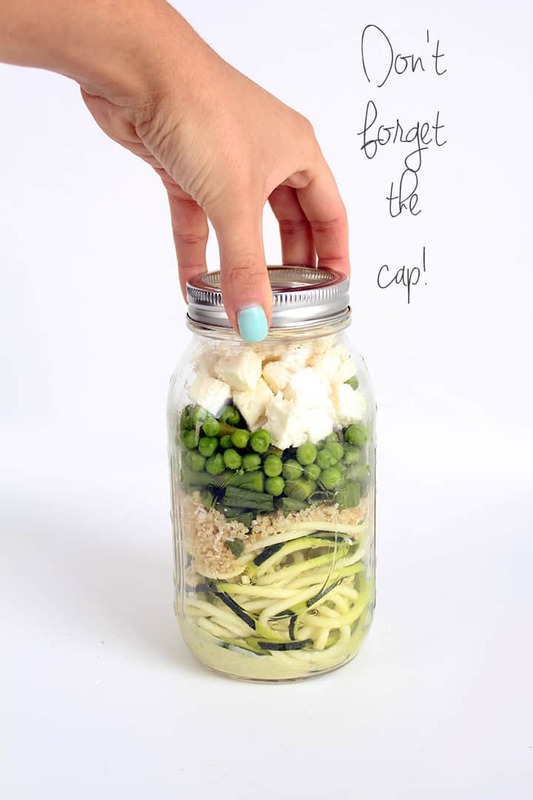 Put the lid on the mason jar and refrigerate for later use. 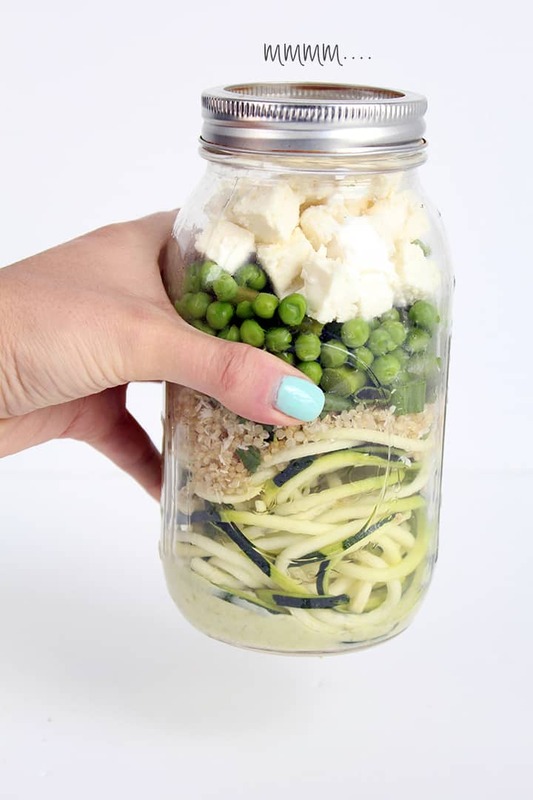 Hi Ali, you've "inspired" me to purchase a spiralizer...on it's way as I write... Just wondered how long the mason jar salad stays fresh inside jar? How many days could one be made in advance? Thanks!! I'm so happy to hear that! Yay! About 3-4 days - with an avocado-based dressing, it can start to brown early on, but with other sauces, definitely 3-4 days! I’m wanting to make this salad. My question is if you cooked or blanched your zucchini noodles before putting in the jar? Or do you just eat the noodles uncooked? Hi Amanda! We eat the noodles uncooked, but these can be made however you prefer! I got inspired for mason jar salads from a Refinery29 article-- have you seen it? Would love to see more mason jar recipes for more ideas ... Spring and summer salad ideas would be so welcome right now! Great idea! I'd love weekly mason jar recipes! Try organic grocery stores! Sometimes those have bigger veggies. Unfortunately, you may have to wait until the summer! I would love to see different salads! I eat paleo so I love choices and crazy combinations! Can't wait to see more! 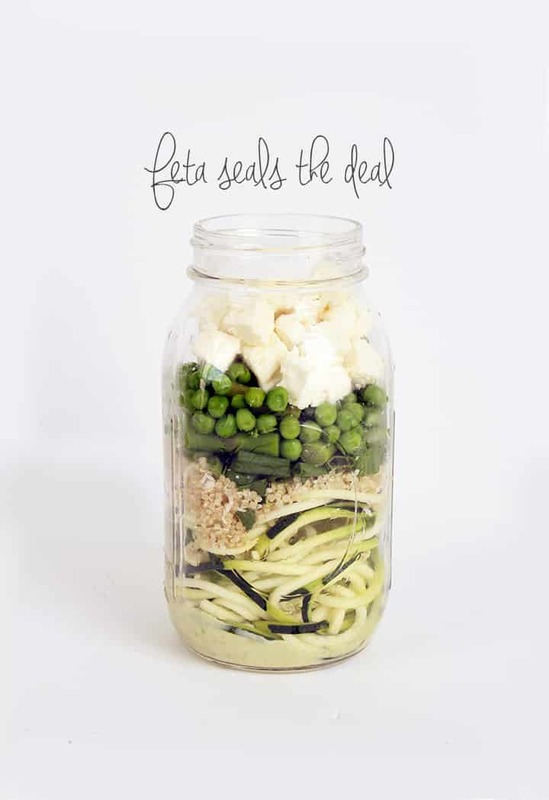 This looks great & love the idea of mason jar salads with spiralized veggies. Question - how long do you think these type of salads would last (could you prepare a few days worth at one time)? About 3-4 days - with an avocado-based dressing, it can start to brown early on, but with other sauces, definitely 3-4 days! Love this! Just had it for dinner and it was delicious. Definitely a winner! 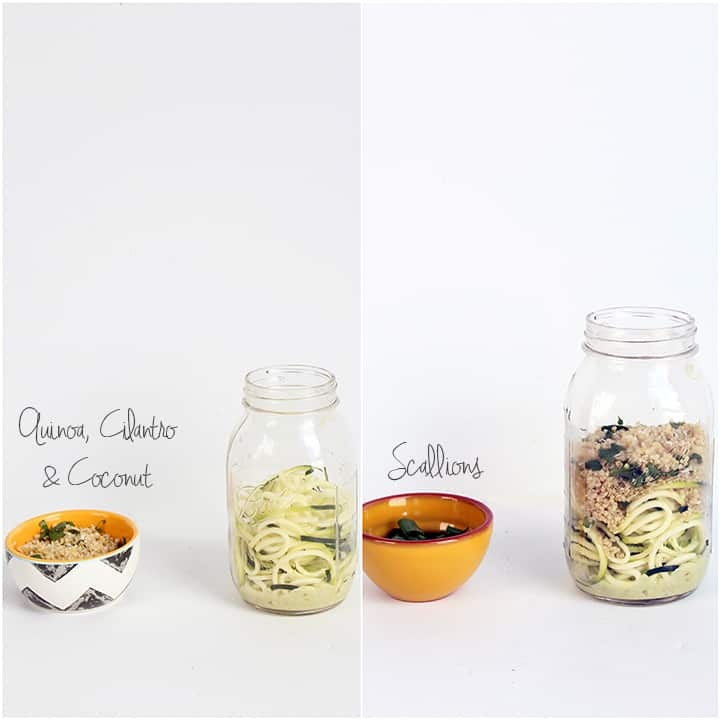 The mason jar Zucchini noodle idea is great. Is the Zucchini raw? I assume it is because in the instructions, I didn't see that you cooked it? Thanks! Yes, it is raw! I've been doing Mason jar salads for a few weeks now and am always looking for ideas. What do suggest in place of cilantro? I can't stand cilantro in anything and won't use it. I'll just leave it out, but am always looking for a good replacement. Haha, I actually know a lot of people who dislike cilantro! I'd say just leave it out or maybe add in some mint for freshness! you’ve “inspired” me to purchase a spiralizer…on it’s way as I write… Just wondered how long the mason jar salad stays fresh inside jar? nice job!! About 2 days! The avocado dressing is tough to keep fresh! Great idea! I would LOVE a dairy-free version!! Hi, I can't wait to try this recipe... have to run out and buy mason jars. One question though...I am new to quinoa, do you cook that as per the directions, or do you add it dry and it expands due to the water in the salad? Sorry, I am completely clueless about Quinoa...only used it once. Just tried this.... It is fantastic!! I added a little roasted garlic to the dressing, and it was like perfect guacamole, sans the tomato. But seriously. This is a must make! Its very well balanced, and every bite is interesting! Thanks for sharing!! This was tasty enough--but hard to get the dressing out of the bottom. Maybe putting a few zoodles in the bottom then the dressing then the rest would work better? I know not so photogenic but would save me trying to reach in and pick it out with a knife. What does blade c mean? Check out Inspiralized.com/howto - it's the blade labels! your blog is so beautiful. I'm absolutely loving the inspiration! 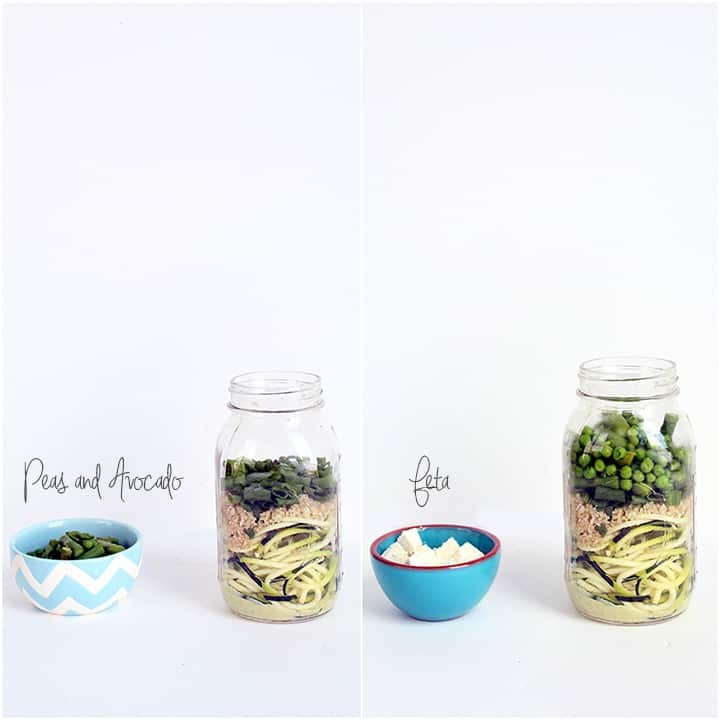 Have you ever put frozen vegetables in your salad jars? Think that would work? Was wanted to throw frozen peas and cauliflower in mine, cuz I'm lazy : ) Maybe would get watery? If the cauliflower is raw and the peas just blanched, it would be great. How many mason jars/servings are in this recipe? Delicious salad, loved it. Besides being quite nutritious. Congratulations! Hi, Your recipe looks and sounds so delicious; definitely making for lunch this week. There's a disconnect on the step that reads to top with peas and asparagus because your image reads peas and avocado. 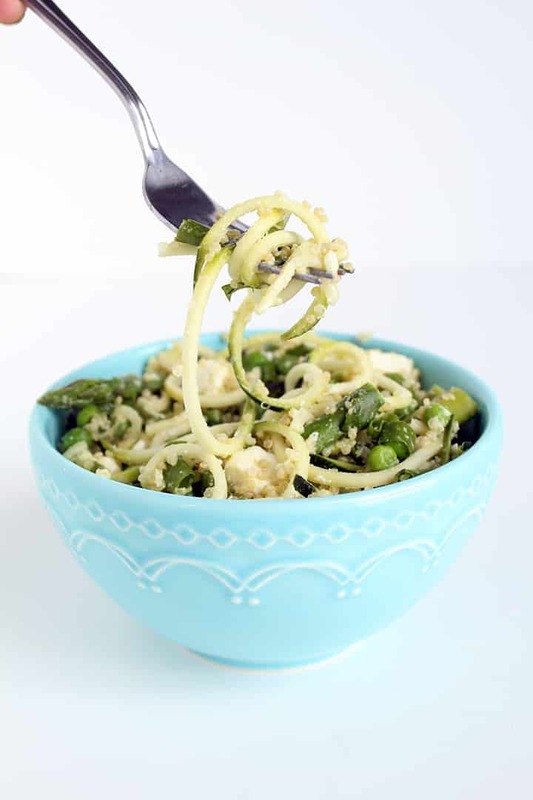 Do you cook the zoodles before or just use raw ones?? These are not cooked - the zucchini noodles act like a replacement for lettuce in this salad. Hi everyone, it's my first visit at this web page, and post is truly fruitful in favor of me, keep up posting these types of posts. Com esse método é impossível você falhar!